Our Functional Scottish Targe is made with wood, and overlaid in black leather; It is accented with numerous brass studs. The suede-covered back of the shield is finished with a thick leather arm strap and hand grip. 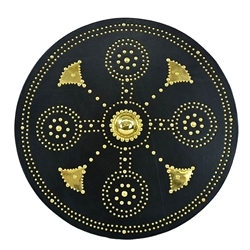 The term targe refers to various types of shields used by infantry troops from the 13th to 16th centuries. The design was first developed in Spain. From the early 17th century, until the Battle of Culloden in 1746, the Scottish Highlander's main means of defense in battle was his targe. Although some targe designs appear to have been more popular than others, there is very little to indicate that there ever were ''clan'' designs.